One of the best parts of owning and riding a motorcycle, in my opinion, is being able to drop what you’re doing, load up your bike, and riding off, letting the road take you to who knows where. Unfortunately, unlike a car or truck, your motorcycle does not have a lot of extra space to store everything you may need to take on your journey. Before we continue, if you for one second think that you can get away with nothing more than the clothes on your back, think again. After all, bikers are looking for adventure, but they aren’t crazy. Riders still require at least a few necessities, like clothes, food, camping gear, etc. The newest update reflects the current trends in motorcycle bags. Every season new bags enter the market and we always update our products to ensure we're offering you the most effective and trendy products. With this update we added new bags as well as a FAQ section to answer some of the most common questions consumers have when it comes to motorcycle bags. Whatever you decide that you need to take with you on your travels – this buying guide is here to help you find the bag that is perfect for your needs. Because that’s what it comes down to. Bags. This is the best solution to create the extra space you need, and there are a huge number of choices out there. In the interest of variety, I’ve decided to include a range of selections from a few key styles of motorcycle bags. I did this in order to include bags for long distance rides, quick jaunts through town, and everything in between. Just because you only use your bike as a commuter vehicle to get you to work or school, that doesn’t mean you won’t need to bring along some extra items. So, ideally, whatever your needs may be, this guide should be able to steer you in the right direction. Each of those three selections listed above covers a different type of bag. That was a bit coincidental, but it helps to showcase just how many options there really are. It also happens to be one of those items that are pretty easy to make, so many of the choices are from companies that just threw them together quickly with very little quality control in order to get a piece of the market. So, having said that, let’s dive in and take a look at some of the most high quality, reliable motorcycle bags available today. Here we go with a classic option. 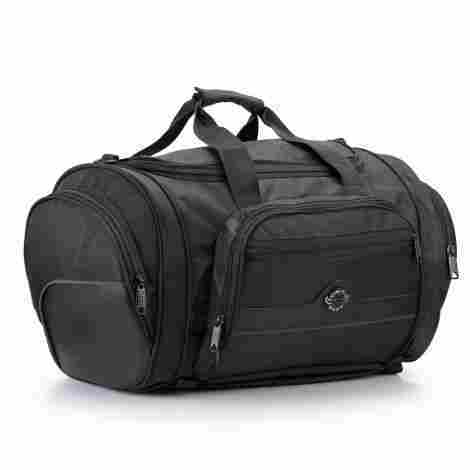 This is a specialized duffel bag that has been reinforced with everything you’d need for a top-class motorcycle beg. Viking made this one versatile enough for every type of ride, from short jaunts to cross-country excursions. The best part about this bag is its durability. It’s built strong to hold up to all abuse, all while doing what you bought it for. That really is what Viking is best known for. Their high-quality products built for riders. Not only is this bag perfect for all of your storage needs, but it also comes with all of the attachments necessary to make sure that while you’re on the road, it’s not going anywhere. It starts with an easy mounting base and then uses hidden bungee cords and hooks to hold it fast to your bike. Motorcycle riding can be especially dangerous at the best of times, but none more so than at night. Visibility is poor, and drivers have a greater chance of hitting you. That’s why, it’s a good idea to take extra measures to make yourself seen, and having this bag with its reflective piping will go a long way to help you get noticed. This is a well-built bag that has plenty of room and storage options, yet isn’t so bulky that it gets in the way during your everyday rides. So when you purchase this bag, you’re getting strong reliable quality for a very reasonable price. Next up, is a dry bag that looks and acts a lot like one of those old travel trunks that people used while traveling the world. This one, fortunately, is a modern interpretation and provides ample room to store your necessities while not be intrusive or overly bulky. What you’re left with is an attractive travel bag that just so happens to fit perfectly on your bike, and is sturdy enough to be there for many years to come. This bag comes equipped with six separate D-rings for mounting. What makes that unique and particularly useful is that they located them in strategic places on the bag, allowing you the versatility to attach it the way that best makes sense for your needs. For a trunk bag, this thing packs a bunch of features that were all designed to make life easier for you, the rider. From a rain cover to a security lock, and even a whole range of pockets for your convenience, this bag takes care of things so you can concentrate on making the ride as enjoyable as possible. I was very impressed by the quality construction and design of this bag, and when it came to looking at the price point it was being offered at, I was honestly surprised. For all of the attention to detail and well-tailored construction, this bag is cheap, and therefore a very good value. Six metal D-rings allow for multiple ways of securing the bag to the bike. This is a serious looking backpack hybrid bag. That’s because it was meant specifically for you, the rider. Seibertron is well known for their top quality motorcycle backpacks, and this one is no exception. It has a well-made, sturdy, waterproof shell that will protect your belongings with ease. It is a bit on the bulky side, but when you need reliable storage that can go with you wherever you may be, and not get in the way while on your bike, this bag more than makes up for its few shortcomings. If you’ve been researching motorcycle backpacks for any amount of time, you have noticed that the overwhelming majority of them are priced much higher than this one. That, unfortunately, because it is a specialized product, and as such, companies can often get away with inflated prices. Not here though. It was built to do a job, that’s it. No frills means you won’t be overcharged. This bag wasn’t designed to make any kind of statement as far as appearance is concerned. If it was, it would cost several times more, much like the competition. Instead, it has a minimalist approach, and does the required task without fail, time after time. Wow. After the initial glance, it’s clear that this bag has something to say, It’s so shiny and classy looking that it screams elegance. Once you get past that, though, you find yourself with a completely waterproof vessel that is going to be with you for many years to come. It has a very simple design, one that compliments any type of bike, and is ideal for any purpose. While it is most useful on longer journeys, this bag will work admirably for your daily commute. By virtue, the design of this bag on the surface looks like it should be a lot smaller than it actually is. No matter what size you choose, chances are that you’ll never have an issue fitting in everything you may need to bring along. Everything about this bag is about being long-lasting. The outer shell is made from highly durable vinyl, and the whole thing has been waterproofed, so if you’re only looking to have to buy a motorcycle bag once, then, by all means, this is the one for you. What may first seem like a staggeringly high cost is quickly justified by the incredibly tough, completely waterproof build. No matter where you take this bag, it is going to protect your valuables without compromise. Once you factor in the added peace of mind, this bag becomes a steal. Now we’re not messing around. This bag is more like a reinforced crate, meant for the longest, most intense rides. The heavy duty aluminum means that you’ll have no problems with it being able to last under the abuse you put it through. It is going to cost you a pretty penny, but that just reiterates the fact that this one is not for the faint of heart. For those who ride hard, not stopping until they can’t go any further, this is the product for you. Not exactly, but for something that is so rigid and holds so much, this has a shockingly small footprint. Sure, it’s pretty hard to miss, but it won’t be restrictive in any way, so you can ride on knowing that all of your belongings are being well taken care of. Not only is this hard case going to hold almost anything you could possibly need to take with you, but it’s going to do one even better with several extra tie downs included throughout the exterior shell. That means you take even more with you, and be ready for any situation. This is a very expensive piece of luggage. If you’re a more casual rider who likes to pull the bike out on weekends for a few hours, this may not be bad for you. If, however, you log thousands of miles at a time, this is a great value that will be well suited to your needs. Let’s take a look at another motorcycle backpack, just for the sake of variety. This one, from Ogio, is on the other end of the spectrum. It’s sleek, streamlined, and expensive. That added cost, though, takes in to account everything that went into making this a high-end product with a deceptively large capacity. This thing is so bad-looking, in a very good way. Thanks to the sleek, streamlined design of this bag, it’s going to stay out of your way while riding, making it the perfect take anywhere, do anything bag. From the bike to the classroom, this could very easily be your go-to bag. The outer shell serves two major purposes. First, its carbon fiber weave is tough and sturdy and is going to last you a very long time before it even begins to wear down. Second, all that reinforced fabric gives it a very appealing aesthetic that will turn heads as you drive by. Sure, this backpack is quite a bit more expensive than the previous motorcycle backpack on this list, but the price is actually closer to the typical price. Nonetheless, this pack is very well-made, does anything you need it to, and will quickly earn its worth as a high value, top-notch pack. This bag is exactly what it sounds like. It sits up front with you, sitting in the fuel tank and giving you instant access to anything you may need to get at quickly. Not only that, but it is made very well, so it’s going to sit with you for many seasons to come. It’s waterproof and attaches to your tank either magnetically or via straps, so it’s not going anywhere. It’s made for riders who prefer convenience and performance at the same time. Since this type of bag is meant to stay out of the way, sometimes it can be tricky to hold everything that you need, necessitating other types of luggage. Or, you can just get this one, with its expandable main compartment so you can hold more, while still only having the one bag along for the ride. This bag not only sits on the fuel tank, it conforms to the shape of it, so what you have is a convenient storage vessel at your fingertips that stays out of your way and does not restrict anything. When you need to concentrate on the road, you don't even know it’s there. Given its relatively smaller size, this bag comes in a bit too close to the top of the spectrum as far as the bags on this list are concerned. That being said, it is very well made for what it is, and the abuse it needs to stand up to may well justify its higher price tag. Throughout this list, I’ve included quite a few motorcycle bags that are very useful for shorter, everyday rides. Well, here’s one more. The reason this messenger bag is on here is simple: It holds your everyday valuables and is great for school or work. Stationery, personal electronic device, and an extra sweater, you name it. 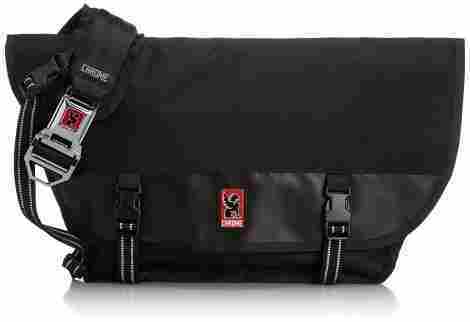 Big, expensive bags and crates are awesome for those weekend road trips, but when you need to get around town, this unisex messenger bag from Chrome is all about convenience. This bag is built to withstand the elements day after day. As such, it’s going to get a bit dirty at times. Luckily, cleaning it is a matter of hand washing it with the help of a nylon brush, and then laying it flat to dry. Simple as that. The whole nature of a messenger bag is all about convenience. 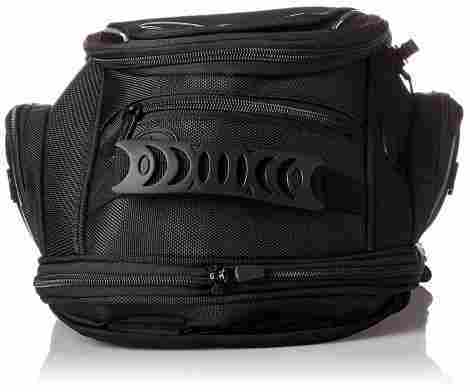 It’s compact, fits snug to the body, and allows for easy access to the items contained within. When you’re on the go, all you need to do is strap it on, and it’s going to come along for the ride, anywhere you go. For many of the selections on this list, there is a theme developing. They are all very well-made, hold up well to the hazards of the road, and are pretty darn expensive. While there are a few lower-priced items on here that are just as good, for the most part, you get what you pay for, and this bag gives a very good return. Wolfman shows up a couple times in this buying guide, and for good reason. Over the years, they have come to be well-known and respected for their all-around solid builds and reliable, versatile bags. Anything you may need in a motorcycle bag, chances are that Wolfman has the perfect solution for you. This tail bag is one of their finer examples and serves as a perfect compliment to your ride’s setup. They also don’t seem to charge all that much for their products either, which is great for those just getting into riding. One of the better aspects of this bag is the fact that the manufacturers have provided several options when it comes to mounting the bag onto your bike. Use a rack, or just the seat itself. Whatever you want to do, this bag has got you covered. 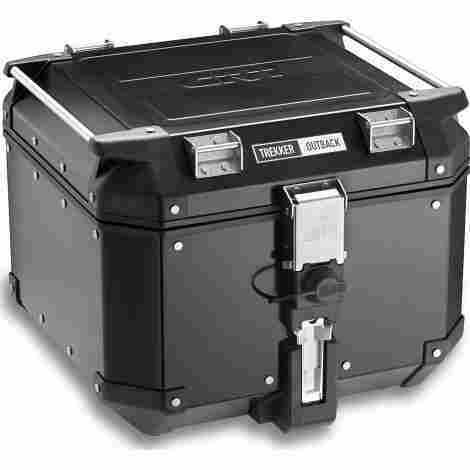 The name Wolfman in the field of motorcycle storage equipment is pretty much the epitome of high-quality craftsmanship. Everything they take finds its way in someones "best of list". Years of attention to detail has earned them a ton of respect. For what this bag brings to the table in terms of quality, satisfaction, and performance, the extra money that you’ll spend compared to other dry bags is negligible. For basically the cost of a motorcycle backpack, you get greater capacity and increase functionality. So, in this case, it’s worth the money. For the last item to be featured in this buying guide, I'm going to add another motorcycle backpack. This time, though, I`m going all out. 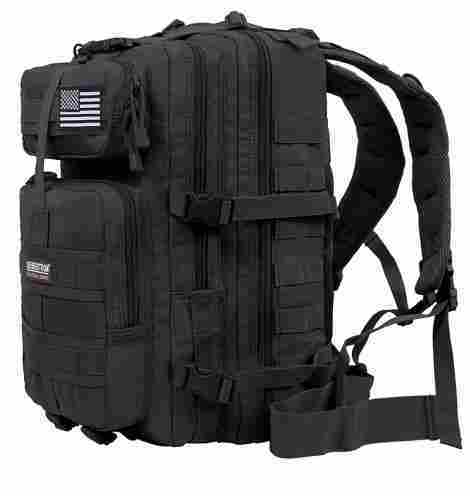 This bag is marketed as a motorcycle backpack, but can just as easily pass for a military bag. It’s tough, versatile, and holds a whole bunch of everything you may need. The reinforced straps will keep it on your back while keeping you comfortable in the process. Overall, this is pretty much a must buy if you need an incredible bag. The makers of this bag seriously thought of everything. They’ve even included a tool pouch that can be removed, giving you easy access to everything without having to mess around with an entire pack’s worth of stuff. When you’re done with it, it zips right back into place. 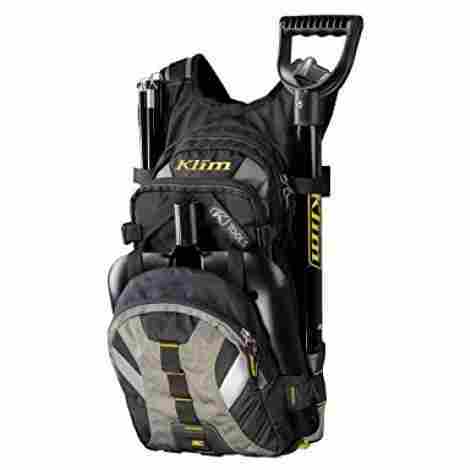 On top of all of the stuff, this pack holds the ability to carry along up to three liters of water. That is a perfect feature for anyone who likes to get out and ride all day. Of the three motorcycle backpacks features on this list, this one is right in the middle as far as price goes. That’s not to say that any of the selections are not worth their cost, because they are. In terms of value, though, this one has just a bit of an edge over the others. Now that we’ve gotten all of that out of the way, the goal is that you as the consumer are now able to make an informed choice when picking the right bag. This is important because the wrong choice can lead to a cramped, uncomfortable ride with a bag that is way too large for what you need. After all, if you’re on your way to school and only need to bring your laptop, why would you shove it into a duffel bag and strap it to the rack on the back of your bike? So really, what it all comes down to is the particular needs of the rider. Using the above guide, you should it should be pretty clear what each bag type has to offer, so go ahead, take your pick. Much like when buying luggage, the price can range from just a few dollars to several hundred. This all depends on capacity, materials used, style of bag, and the number of features, or lack thereof. Naturally, how much stuff the bag holds does play a part in the pricing, though not as much as one may think since there are some bags that hold 14 letters that cost as much as, if not more than bags that can hold 60 liters or more. However, once you start getting into upper levels of capacity, the price does tend to balance out, with the higher capacities being priced accordingly with those of smaller volumes. Materials used is another fairly minor factor in determining price, as most of the good bags are going to made from materials that are strong, lightweight and breathable. Also, if they aren’t inherently waterproof, then they will almost certainly be giving a waterproofing treatment to ensure that they hold up to the elements. Outside of the bags and storage containers that are made from strong, rigid plastics, the materials used for motorcycle bags are typically strong synthetic fabrics such as nylon or polyester, or durable natural fibers such as denim, canvas, or hemp. All of these materials are praised for their wear resistance and durability, though some concessions need to be made in order to ensure that are breathable and waterproof. The style of bag generally goes hand in hand with the features that you’ll find included, so we’ll be looking at them together. Further along, I go into greater detail regarding the types of bags available, so her I’m just going to relate them briefly to the features. The biggest feature is going to be capacity, and for that, the saddlebags are the better option. They may not have the largest capacity, but they strike the perfect balance between volume and stability. Saddle bags also excel in the category of convenience, as they are located within reach just behind the rider. Next is related to capacity, but more specifically concerns what you need them to carry. The motorcycle backpack wins here, as they are designed to hold all the necessities for a busy everyday life, including specialized packets for laptops or tablets, stationery pouches, and other such dedicated pockets. Overall, given the limited space and reduced requirement for having a bunch of added features, it is a combination of all of these elements that will help to decide the final price of the bag. Capacity can be a bit tricky when selecting the right bag for the job. You may feel that you need your bag to be able to carry a very large amount of personal items, but unfortunately, bikes are pretty limited in terms of room. That being said, there are a lot of different bags that manage to address these shortcomings in a way that helps optimize what precious room you do have. The upper capacity of bags does depend on the style and brand that you choose, but some typical volumes range from 14 liters to upwards of over 80 liters. Obviously, the more the bag holds, the more room it is going to take up. If the bag is too big, then you begin to run the risk of it shifting the center of gravity and making the bike too top heavy. This can be extremely dangerous on the road and can lead to terrible accidents. A common way to combat this limitation is to purchase several bags of the same type and stack them on top of each other. In fact, some manufacturers make bags and other storage containers that are designed to do exactly that, each one fitting together seamlessly. While stacking is an effective method of extending your capacity by going up instead of out, again, it can lead to the bike being off-balance, and can also result in an accident. The best solution when it comes to safely maximizing your capacity is to choose the largest bag that will safely fit on your bike, and prioritize what you bring accordingly. If for some reason, this isn’t an option and it becomes necessary to carry a large abundance of equipment, then a motorcycle trailer may be a sound investment. When I refer to style in relation to motorcycle bags, I’m talking about something very specific. I don’t mean in terms of fashion so much. There are several different types of bags that can be used while riding a motorcycle, each one with their own distinct benefits and drawbacks. So by style, I’m talking about saddlebags, motorcycle backpacks, rack or duffel bags, and messenger bags. There are other styles, but those that can’t be lumped into one of the other categories aren’t going to show up to much when you’re looking to buy a new bag. Starting with probably the most common of all motorcycle bags, the saddle bag is an iconic accessory that has been serving bikers well for decades. To describe them, they are actually a pair of equally sized bags that are connected by a strip of fabric and hangs off the back of the bike. These are found quite often on touring bikes, as their large capacity and relatively out-of-the-way placement make them ideal for long rides that take several hours or even days. Since saddlebags are pretty exposed to the elements, they are usually made from a thick, sturdy material that has been given a waterproofing treatment. Recently, some companies have taken to making saddle bag style storage bins made from a hard plastic or nylon that work much the same way. Next up is the motorcycle backpack. While many riders opt for a traditional backpack, if you’re going to spend the money, it’s probably a better idea to get one dedicated to riders. Regular packs don’t allow for any weight distribution, aren’t very comfortable, and their design makes them cumbersome on a bike. Motorcycle backpacks are typically made from strong, yet lightweight materials that are essentially weatherproof. They also tend to be breathable in order to minimize sweating and overheating. 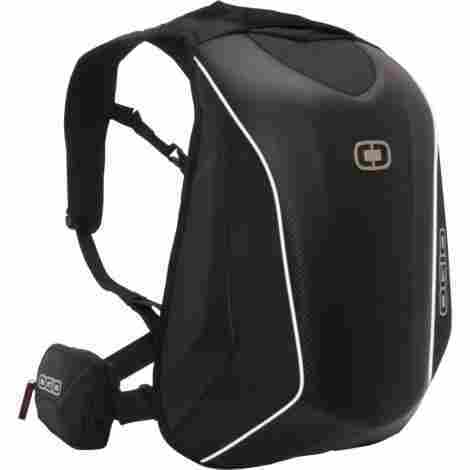 They offer all of the benefits of any backpack but have an increased capacity while fitting snug against the body. This allows for full freedom of movement while minimizing drag. They are going to be quite a bit more expensive than a normal school bag, but the reinforced construction will ensure that they hold up to abuse and last the rider for years. 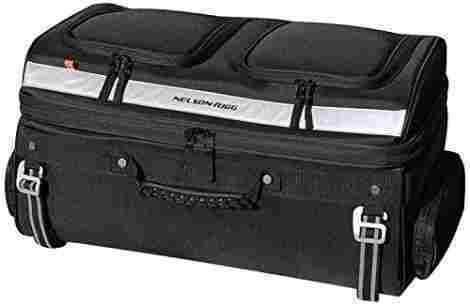 Rack bags, rolls bags, or duffel bags are all different versions of a motorcycle bag that is meant to be strapped on to a travel rack that is found behind the rider’s seat. For the most part, these bags are not rigid at all, instead of being malleable so as to maximize the limited space given. There are some exceptions, as many bags exist that also fit behind the rider, but are made from plastics os other stronger materials. These are also meant for longer journeys. Once possible concern is the center of gravity if the rack bags are packed to high. The common, all-encompassing name for these bags is known as the dry bag. Their price is largely determined by the materials used as well as the capacity and can vary widely. The final style of bag that we’ll be looking at is the messenger bag. These aren’t necessarily meant exclusively for motorcycles, but their usefulness is definitely appreciated by riders. Originally designed to be used by messengers who carried documents and other information by means such as horse or bicycle, they have quickly been adapted by motorcycle enthusiasts thanks to their being lightweight and unobtrusive. These bags excel on short rides and sit close to the body. This way, they don’t restrict movement, though they do lack the capacity of a backpack. Choosing the right motorcycle bag comes down primarily to need, even more so than any price considerations. You may get a great deal on a duffel bag, only to discover that it is more of a nuisance that you only use to drive a few blocks to work or school. In the end, the best practice is to research a variety of bags, try them out if you can, and ask a lot of questions until you become certain that whichever one you choose is the perfect fit for your intended purposes. Saddlebags: This is a pair of bags that are connected by way of a starp of fabric, and are situated behind the saddle, or seat, of a motorcycle. Because they tend to be exposed to the elements quite often, saddlebags are typically made from rigid materials such as leather or plastic. Messenger bag: A bag that is worn across the body via a long strap. These were originally made for use by couriers and postal workers who would deliver messages by horse or foot. They are usually made from strong, weatherproof materials, either of a natural fiber or a synthetic fabric. Messenger bags are a popular choice for riders because they fit snug to the body, keeping them out the way while allowing full range of motion. Leg bags: A drop leg bag is similar to a fanny pack, but it sits off of the hip and is much larger. They are made from sturdy fabrics like polyester, and usually, feature a large flap closure to help protect contents from the weather and other damage. Luggage racks: These are racks that fit behind the seat of the motorcycle off of the rear fender. They are used to provide some storage space for holding luggage of some form. Tank bags: A type of storage bag that sits in front of the rider and is contoured to conform to the shape of the fuel tank. Many if these are very versatile, featuring expansion zippers, multiple compartments for your belongings, and rain covers. Also, because of their shape and design, they do not get in the way of the rider steering the bike. Tail bags: Compact travel bags that sit behind the rider, and strap to the seat, sissy bar, or luggage rack. They mount and are removed very easily, making them ideal for all types of riders. By necessity, they are durable and weatherproof and can come in a variety of styles and shapes. 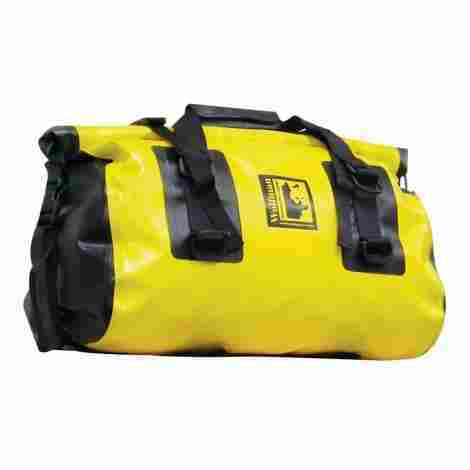 Dry bags: This is soft shell motorcycle luggage designed as a single compartment bag usually made from PVC because of its inherent waterproof properties. Since they are dry bags, and as such need to make sure no water gets in, they are made to contain as few seams as possible and built in such a way as to create a single membrane. Cargo net: A mesh net made from stretchable materials that attach to the bike with several hooks, and is meant to keep all of your bags and other belongings together in one spot. One major concern for these nets is known as “fall through”, which is literally when the contents fall through the spaces in the net. This can be reduced by making the spaces smaller, and many cargo nets are spaced no more than two inches apart. Pannier: Another name for a saddlebag. The name pannier is usually attributed to saddlebags that are made from softer, less rigid materials. Q: What’s the difference between all the types of bags? A: Really, in the end, it all comes down to capacity and the individual needs of the rider. For example, tail bags are going to have some of the highest capacity, but also will take up the most room. Alternately, tank bags are going to be smaller, but because of their smaller profile combined with the fact that it contours to the fuel tank, can often be seen as the most convenient option. Q: How much stuff do people usually carry? A: Different people on different types of rides are going to require different amounts of stuff. For longer, cross country trips, riders are going to require extras clothing, food, water, and various other gear. For short in town commute, though, something like a messenger bag becomes ideal since not much more than a laptop and a few smaller items is going to be needed. Q: What happens if the bag falls off the bike? A: Hopefully, that is a scenario that never happens to riders, but realistically, when it does happen, most of the bags are designed to absorb the impact and take the brunt of any damage. The softer shell bags are obviously going to offer less protection, but even then will often suffice to safeguard the rider’s possessions for the most part. Hard shell cases, on the other hand, are specifically made to withstand the hazards of the road, and anything contained within is pretty likely to remain mostly unscathed. Q: Do the bags really protect my stuff? A: Yes. In Fact, that is often the main purpose of the bag. Many are made with highly durable fabrics that absorb impacts and resist wear and tear. Q: Why can’t I just use my old school backpack? A: For all intents and purposes, an everyday normal backpack can be used to hold your stuff while on the road. For the most part, it should up pretty well, until you factor in weather resistance. Motorcycle backpacks are made to hold your stuff, obviously, but it’s going to do it to a much higher standard than any school bag is ever going to. Q: Why are motorcycle bags all so expensive? A: I’d like to say that motorcycle bags are so pricey solely because of how sturdy and well-built they are, and that every extra penny you pay will take care of your stuff that much better. While that is mostly true, unfortunately, the biggest reason is that motorcycle gear is so specialized that manufacturers can easily get away with charging more for their products, because, really, if you don’t buy their stuff, chances are you won’t find anything better. 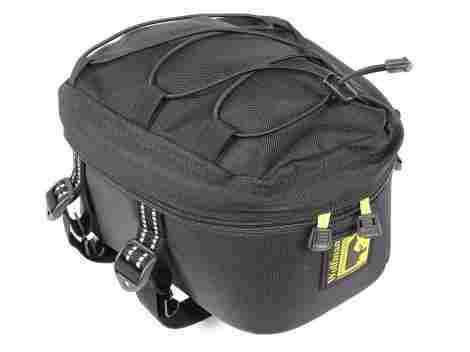 Drive Bag – Motorcycle Backpack vs. Regular Backpack. Is it worth the money?